Detroit, MI, October 6-7, 2016 – ArtChangeUS REMAP: Detroit was the third in a series of convenings reframing the national arts conversation by responding to the demographic transformation of America and the vital role of the arts. The theme of ArtChangeUS REMAP: Detroit, “Majority/Majority: We Remap the U.S.” recognizes Detroit as a city that represents a shifting paradigm and dynamic cultural leadership. Detroit is the U.S. city with the highest percentage of African Americans, the largest concentration of Arab Americans, founded on Anishinaabe land, and with an historic and growing state-wide Latinx population. ArtChangeUS REMAP: Detroit was produced in partnership with the National Association of Latino Arts and Cultures’ NALAC MI Latinx Art Summit, the Arab American National Museum, the Charles H. Wright Museum of African American History (The Wright), Complex Movements, and Creative Many. ArtChangeUS is a project of the California Institute of the Arts. View a video recap of ArtChangeUS REMAP: Detroit above! 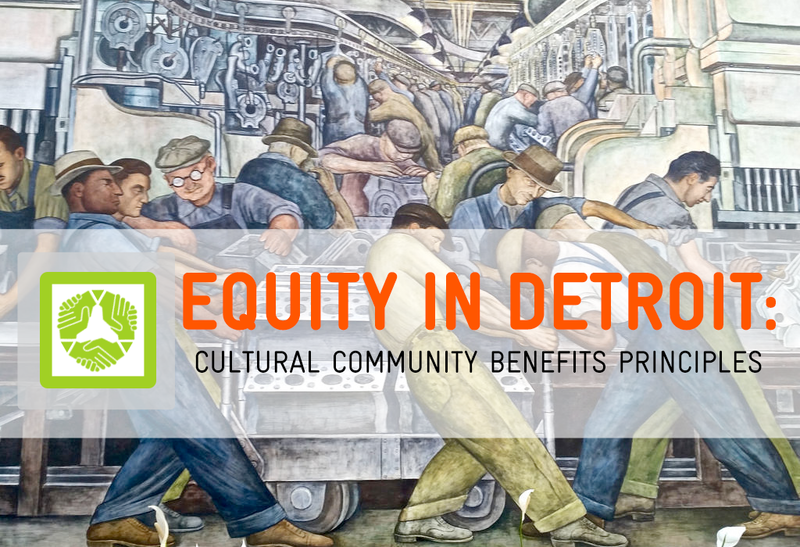 Arts in a Changing America organized ArtChangeUS REMAP: Detroit according to Cultural Community Benefits Principles collaboratively developed with Detroiters for our event and which we will continue to uphold in the organization of future REMAP events. These principles are based on organizing work in Detroit on their local community benefits ordinance Proposal A campaign which would facilitate community benefits agreements (CBAs) for Detroit. To learn more see risetogetherdetroit.com. We support the efforts of all communities to seek accountability from private developers who receive public support for large scale development projects through CBAs. Interested in following Cultural Community Benefits Principles in planning your next event? View an archive of our event program below! Conversation Pieces: Wearable Art | Michelle’s Creations | K.C. Productions: It’s In The Skin | My Sista Girl | CFranks | Tawana “Honeycomb” Petty | Cr8tive Minds. Arrow Office Supply | HallStarz | Royal Limousine | Honeybee | Good Cakes and Bakes | and the courteous hospitality of Roberts Riverwalk Hotel.